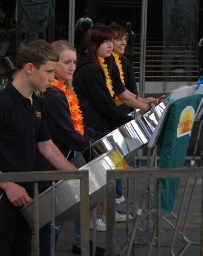 ﻿ Dayspring Steel Band - Join in! Are you interested in joining the band? We take on new players from age 7 upwards. 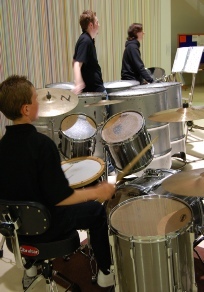 Though helpful, you do not need any experience to play and you don’t even need to be able to read music. You just need to want to learn and enjoy playing with others. We have two band practices on a Tuesday night, 6:30 - 7:00 for Dayspring II (beginners) and 7:00 to 8:00 for Dayspring I followed by a half hour informal youth club meeting. In addition we have an affiliated Adult band who meet on a Friday Morning.